Our company is a leading Magento development service provider and renowned for its innovative, feature-rich, secure and bespoke custom web development solutions. Our team of Magento developers has hands-on experience in the same domain and well-practiced in the implementation of Magento module development and its pioneering features. Having a specialization in Magento development, we endeavor to serve you the best and quality solutions that perfectly match with your exact needs. Creative infoway is the company that can offer solutions to all the Magento related requirements. The company offers high quality performance review and Magento store optimization services at affordable rates. Performance optimization services enable ecommerce store to process the page quickly, transfer the content quickly and render the page on different browsers quickly. 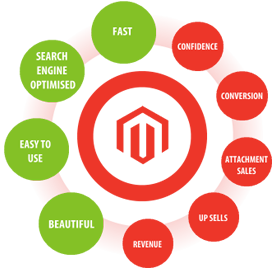 Our review and optimization process also includes analysis of client’s internet marketing strategies. This includes review of their paid search marketing, rankings on various search engines, online advertising and marketing campaigns, PPC campaign management and content’s effectiveness for SEO which also includes right use of keywords. So what are you waiting for, get an exceptional theme for your ecommerce website and attract more customers. Hire our cost effective Magento theme development & Magento theme customization services, contact us now.